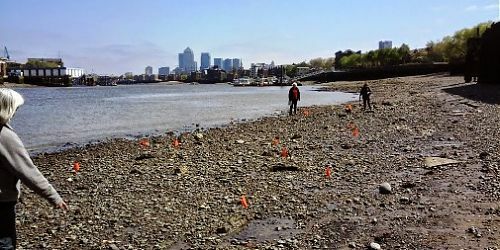 The Bermondsey and Rotherhithe FROG have been monitoring on the foreshore for six years now and we thought this year we would keep a diary of our activities to share what we do on a regular basis, and why we continue to find monitoring the foreshore both interesting and enjoyable. We started the year at our middle site, called King Edward’s Manor (after the waterfront site excavated nearby) not least because it is the shortest and we expected cold weather. It was cold but at least there was no rain and the site was dry and well-scoured by the effects of river traffic. 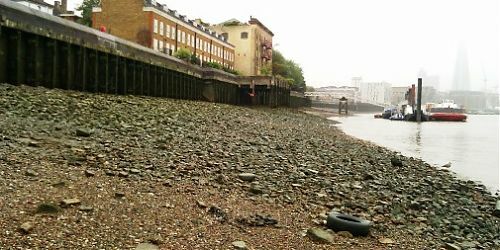 This might appear to be the least interesting of our three sites but, as we have found on the other foreshore zones, increasing familiarity makes it easier to notice change, both the addition and loss of features, and the revelation of new ones as a result of all too active erosion and deposition. This also points up the importance of regular, careful monitoring. 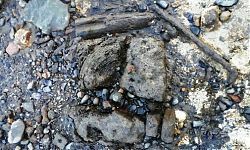 We know there were barge builders on this site and we have several metal scatters to support this but during January’s first site visit we saw for the first time what appears to be the remains of a chalk barge bed and also a number of new timbers which may well be part of a gridiron. So something to think about, try to research and hopefully more will be revealed next time we visit. 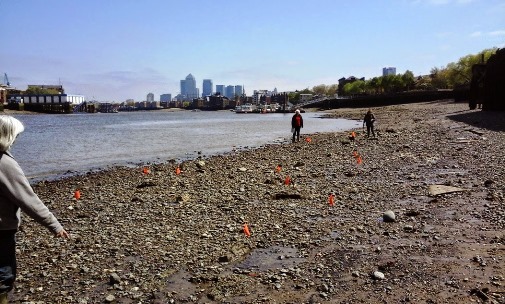 At the end of the month we paid our second visit to the foreshore and this time we were at Bermondsey which we have monitored for longest and know best. A lovely sunny day, and a well scoured surface made for a pleasant session but the tide was not as low as we had anticipated. We do check the tide tables when planning our visits but heavy rain or the action of the Thames Barrier can upset the best of plans. There has been a lot of tidal action here and a large amount of stone and other debris has built up towards the river wall covering some features whilst the lower part of the foreshore is showing signs of considerable erosion. Inevitably there are unusual, amusing or odd finds of the non-archaeological variety and this time we paused by the top of a metal cylinder which we have seen before but was much more exposed today so we could read the lettering around the edge. Was it a bomb, some Second World War debris? 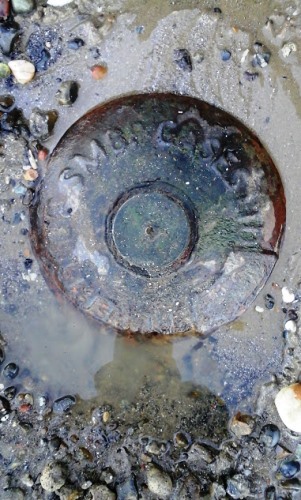 A bit of googling revealed it was a Calor Gas cylinder albeit quite old and buried too deep to hope to be able to claim the deposit for returning it! 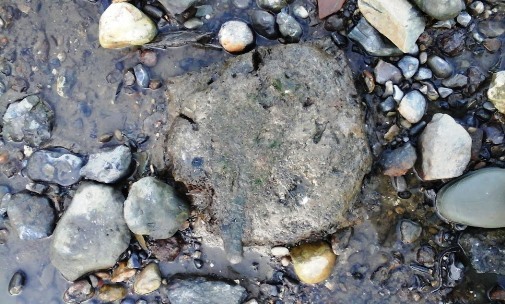 For some time we have noticed a the remains of a number of square posts appearing between the gridiron and Chambers Wharf and have attempted to monitor them by marking them with flags (see below). Our previous count was fourteen but this time about ten more were visible and there appear to be two phases arranged in two rows, pre-dating the gridiron and the chalk barge bed. Did they form part of two separate jetties? Eliott we need help here! 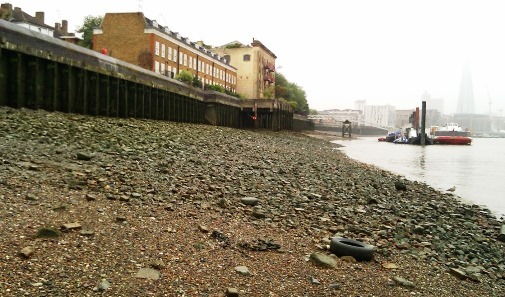 We are conscious that our time on this site is limited as Tideway is due to begin construction soon but we hope to be able to record two phases of what appears to be a causeway linked to the original East Lane Stairs, at the upstream end of Chambers Wharf.